The Ordinary Life of an Extraordinary Girl: The Science of It All - What is Down Syndrome? The Science of It All - What is Down Syndrome? Research Down Syndrome is a non-profit foundation which funds down syndrome cognitive research at leading international institutions. 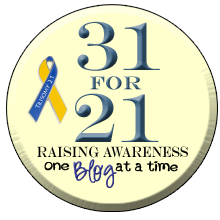 Imagine research geared toward helping people with down syndrome live more independent and productive lives. The following talks about the cause of down syndrome, as well as advances that are providing our children with down syndrome longer and more productive lives. It is estimated that 3-4 million people worldwide have Down syndrome, including 400,000 in the United States. Down syndrome is the most frequently occurring chromosomal abnormality, occurring in approximately 1 in every 700 births. The incidence of Down syndrome increases with maternal age. Despite the correlation of age to incidence, 80% of children with Down syndrome are born to women under the age of 35, due to the increased birth rate of this age group. There is no relationship between the incidence of Down syndrome and race, nationality, or socio-economic status. This condition is described as a syndrome because affected individuals display one or more of a group of distinctive features or associated conditions, which vary in type and severity. Typically, individuals with Down syndrome are of smaller than average stature and have a single transverse crease on the palm, a flattened nasal bridge and an upward slant to the eyes. Frequently present conditions include low muscle tone, congenital heart defects, intestinal obstruction, hearing deficits and hypothyroidism. Down syndrome is associated with an increased incidence of leukemia and testicular cancer. Neuropathological brain changes consistent with Alzheimer’s disease are present in all Down syndrome individuals by the age of forty. Although not all develop Alzheimer’s, there is an increased incidence of this disease in the Down syndrome population. Also, a notably lower incidence of solid tumors, including colon cancer and breast cancer, as well as a decreased incidence of atherosclerosis, is observed. Cognitive impairment is present to some degree in all Down syndrome individuals. This impairment, which typically limits both intellectual performance and adaptive behaviors, is typically in the mild to moderate range. Down syndrome occurs when an individual has an extra copy or extra chromosomal material of chromosome 21. Human cells contain 23 pairs of chromosomes. In the formation of the sperm and egg cells in humans, a process called meiosis divides each pair of the 23 chromosomes. An error called non-disjunction results in a sperm or egg which contains both copies of chromosome 21. This can occur with either the formation of the egg or sperm, and represents 95% of the cases of Down syndrome. When this cell combines with the other cell with the single chromosome 21, the resulting fertilized egg contains 3 copies, called trisomy 21. 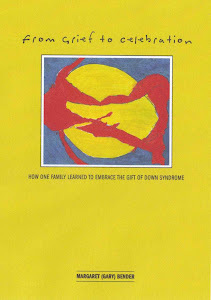 There are two other origins of Down syndrome. In the case of translocation, fertilized cells contain an extra portion but not a complete third copy of chromosome 21. In this case, either the egg or sperm after meiosis contained a single copy of chromosome 21, as well as a portion of 21 attached to another chromosome, most often chromosome 14. This occurs in approximately 4% of Down syndrome persons. A third origin of Down syndrome, called Mosaicism, results when, during early division of the fertilized egg, non-disjunction occurs in one of the cells, resulting in a mixture of cells containing either 46 or 47 chromosomes. Individuals with Mosaicism exhibit fewer of the characteristics associated with Down syndrome. Early identification and treatment of health problems and increased opportunities for inclusion in educational, work and community life enable individuals with Down syndrome to live healthier, more active and longer lives. Life expectancy for people with Down syndrome has more than doubled in the past twenty five years and, today, most individuals with Down syndrome can be expected to survive until age 55 to 60. This increased life span emphasizes the need for continuing development of treatments that will assist persons with Down syndrome to reach their full potential and maximize their ability to live full and more independent lives. I find this fascinating - certainly something to think about.